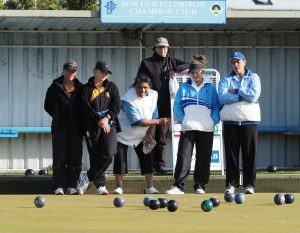 Victoria Bowling Club » Well done Amber, Yvonne, Helen & Leigh! Well done Amber, Yvonne, Helen & Leigh! You are here: Home » Blog » Competitions » Well done Amber, Yvonne, Helen & Leigh! Congratulations to our club champ fours team of Amber Down, Yvonne Gibb, Helen King and Leigh Griffin coming runner up in the Wellington Champ of Champ Fours last weekend at Johnsonville. They lost the final 15-19 to the home Johnsonville side skipped by Paula Meredith. Our mens team of James Fairhall, Chris Nugent, Tim Toomey and Ray Martin lost at the quarterfinal stage to eventual runner-up Upper Hutt.